Week 37 (September 10-16): Closest to Your Birthday Which relative has the birthday closest to yours? I’ve known for as long as I can remember that I share a birthday with a second cousin, who was born 1 year before me. Then that second cousin’s sister was born 11 days after me. Those are close in terms of the month, day and year. Taking the birth years out of consideration, my nephew’s birthday is 4 days before mine. In thinking about this question I wondered how to define ‘closest relative’. Is that years closest to me, generations closest to me, only direct line relatives, etc. To help me with this I considered the average percent DNA shared between relatives, such as the one below. Of those with relatives with birthdays closest to mine in the calendar year, the closest with whom I would share the most DNA is my great uncle whose birthday is August 30, one day before mine. We would share 25% DNA, which is the same percentage as I have with my nephew but his birthday is 4 days before mine. Ernest Bell Willis was the 5th of 9 children born Zedic Hamilton Willis & Mellie Jane Welch and was born on August 30, 1907 in Itawamba, Mississippi. On October 12, 1929, he married Alma Lorene Mauldin, daughter of J. Lester Mauldin & Myrtle M., Lexington, Cleveland, Oklahoma. By 1930 they were living in Noble, Cleveland, Oklahoma and soon Ernest’s parents were also living there. By November 1935 Ernest was postmaster for Noble and continued that role until he retired May 6, 1966. He and his wife raised their children in Noble and remained there until their deaths. Source: Ancestry.com. U.S., Appointments of U. S. Postmasters, 1832-1971 [database on-line]. Provo, UT, USA: Ancestry.com Operations, Inc., 2010. 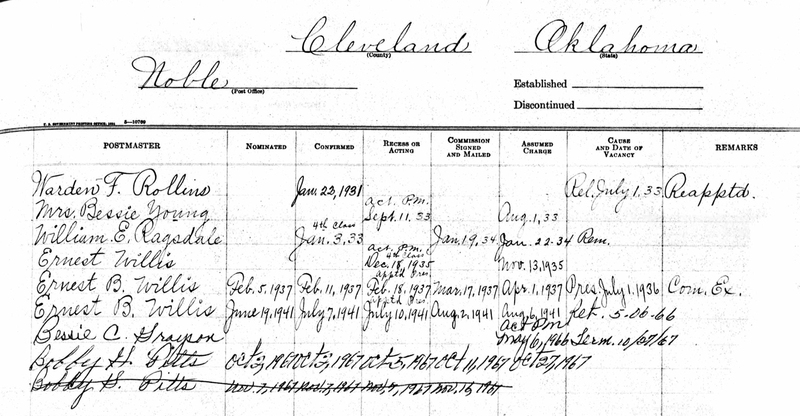 This collection was indexed by Ancestry World Archives Project contributors. Ernest died in Noble, Cleveland, Oklahoma, on April 25, 1978; he is buried in IOOF Noble Cemetery, Noble, Cleveland, Oklahoma, where his parents are also buried. 105 Years Ago Today – post about Ernest’s brother Tommy and their parents and siblings and includes photos. Written by Donna Brown.